James Andrew Harris shook the science world in 1969 for two reasons. First, he co-discovered elements 104 and 105 on the periodic table, a massive accomplishment. Second, he was the first African American in history to discover an element. James Harris was a true pioneer, and he worked hard his entire life to make room for African Americans in the sciences. Harris was born in Waco, Texas, on March 26, 1932. He attended A. J. Moore High (pinned here) in Waco until middle school (despite the nature of the name, the school served Kindergarten through twelfth-grade), but after his parents divorced, Harris moved to Oakland, California, with his mother. There he graduated from McClymond High School. But Harris did not stay in California for long. After graduating from high school, he moved back to Texas to attend Huston-Tillotson College (HTC) and pursue a degree in chemistry. After graduating in 1953, Harris served two years in the United States Army. After his short career as a sergeant, he married his HTC sweetheart, Helen, in 1957. Upon entering civilian life in 1955, Harris set out to find a job and use his degree, but that proved much more difficult than he would have liked. Most employers not only refused to hire Harris, they were shocked he would even apply as an African American for a job in chemistry. Harris remembered one such experience vividly, recalling in a 1973 interview, “I was even given a job test simple enough for elementary school kids— basic addition and subtraction. I told the secretary I didn't need a job that badly.” Other secretaries simply assumed he was applying to be a janitor or suggested that he did so when he mentioned chemistry. Despite these setbacks and the culture of Jim Crow America, Harris did not give up, and his perseverance was rewarded when he landed a job at Tracerlab in Richmond, California, where he worked in commercial research. After five years at Tracerlab, Harris decided to move on and joined the Lawrence Radiation Lab (Lawrence Berkeley Lab), an affiliate of the University of California’s Department of Energy. This lab would prove to be the theater for Harris’s success. He was teamed up with a renowned scientist of the Manhattan project, Albert Ghiorso, and the men set to work to see if they could discover (i.e. produce) new elements. The process by which they did this was complex. The basic method was to bombard certain atomic targets with different elements in an accelerator. This would allow the men to isolate and identify individual new elements at the atomic level. 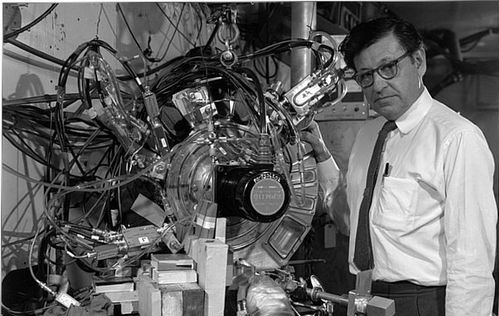 Ghiorso was largely responsible for creating the machines and Harris became the master of making the atomic targets. The atomic targets had to be pure, and, because of this, making them was a tedious and precise process. Harris’s colleagues declared that he was undoubtedly the best target-maker they had ever and would ever work with, making his contribution instrumental. With Ghiorso’s machines and Harris’s targets, the two men identified element 104 for the first time in 1969. They named the element Rutherfordium after British physicist Earnest Rutherford. 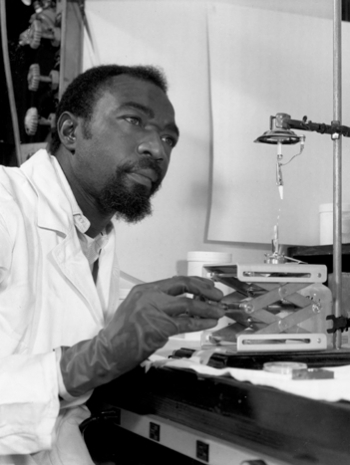 Harris was officially the first African American to discover a new element, and he did it as the only person in his lab without a PhD as well. 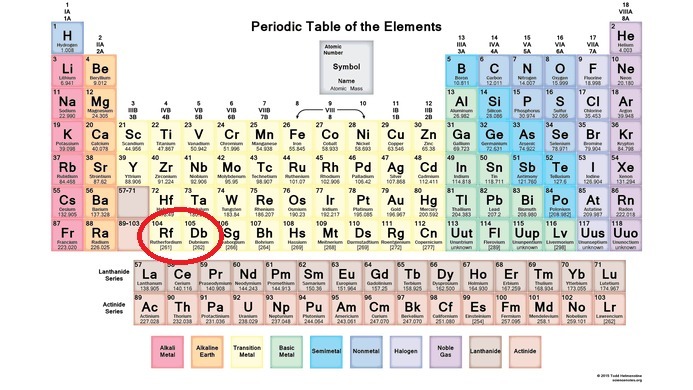 After changing the bombarding element from carbon to nitrogen in 1970, Harris and Ghiorso discovered element 105, commonly referred to today as Dubnium. However, this was not the original name chosen by the two men. They had chosen the name Hahnium after German chemist Otto Hahn, but they had to cede the naming right to Russian scientists from the town of Dubna, from where the element received its official name. The reason was because both Harris’s lab and the Russian lab had identified elements 104 and 105 around the same time. After the naming controversy had been raging for over twenty years, the teams were required by the International Union of Pure and Applied Chemistry in 1997 to divvy up the naming rights: 104 was given the American choice of Rutherfordium and 105 the Russian choice of Dubnium (though the original Russian choice had been Neilsbohrium after Danish nuclear physicist Neils Bohr). 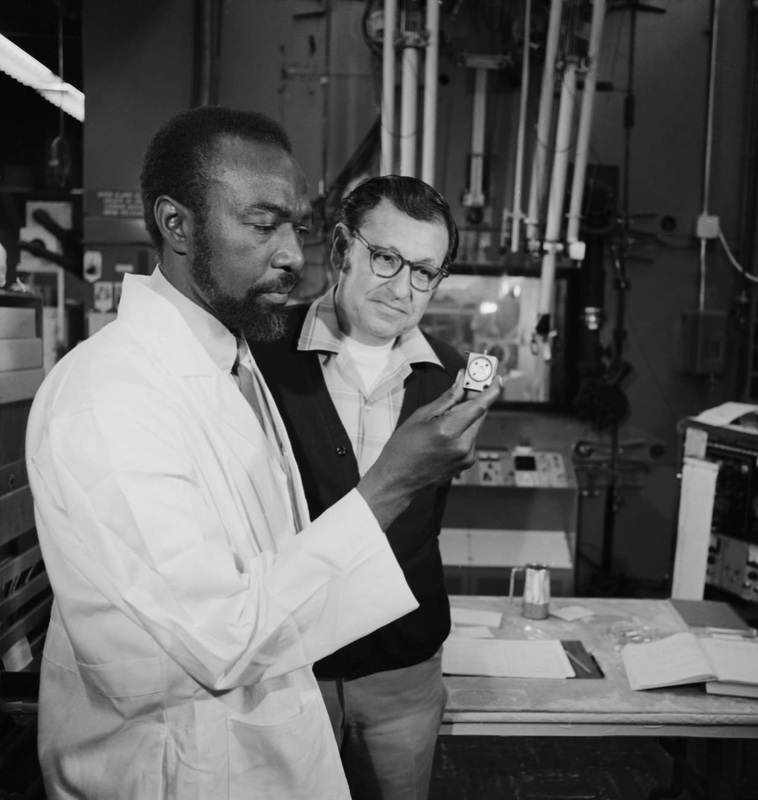 After catapulting to the forefront of scientific innovation because of his discoveries, Harris worked to ensure that other African American children could enjoy the same opportunities. He was awarded an honorary doctorate from his alma mater in 1973, and he did not want to waste the chance to do something good with his acclaim. Harris traveled to schools and universities across the nation to talk to young African American students, especially those from disadvantaged communities, and recruit them to the sciences. His dedication led to awards from the Urban League, the National Organization for the Professional Advancement of Black Chemists and Chemical Engineers, the City of Richmond, Alpha Phi Alpha Fraternity, Black Dignity Science Institute, and the National Organization for Equal Opportunity in Education. Harris was even part of the "Black Pioneers" exhibit at the Oakland Museum, and he was inducted into the Black College Hall of Fame in Atlanta. Harris retired early in 1988 at the age of fifty-six. In his retirement he kept up with his community service efforts, along with many rounds of golf and spending time with Helen and his five children. He passed away on December 12, 2000, from an unknown but sudden illness. Harris at Work: Harris’s Berkeley Lab obituary read: ”Tammy Campbell of the Technical and Electronic Information Department, one of Harris' neighbors and a good friend, recalls Harris having his own trading card from a campaign created by Educational Science Books. The company took the idea of baseball cards and instead made trading cards for scientists, an item that proved to be a great icebreaker for Harris with the children he visited.” ~ Source: Chandler, D.L. “Little Known Black History Facts: James Harris.” Little Known Black History Facts, Black America Web, 9 Nov. 2017, blackamericaweb.com/2017/11/09/little-known-black-history-facts-james-harris/. 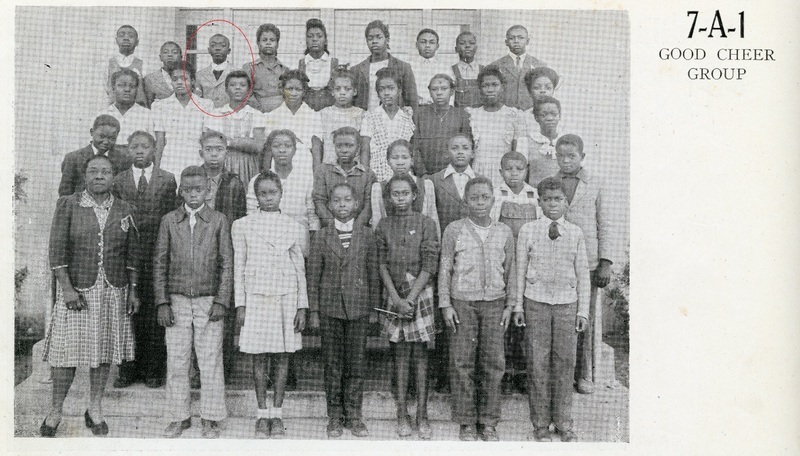 James Harris, Seventh Grade: Harris attended A. J. Moore, the only school available to African Americans in Waco in the 1940s. This image shows Harris as a seventh-grader in 1945. ~ Source: "The Lion," A.J. Moore Yearbook, 1945, The Texas Collection, Baylor University. 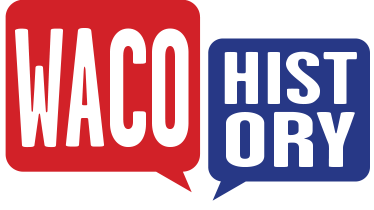 Anabel Burke, “James Andrew Harris,” Waco History, accessed April 19, 2019, https://wacohistory.org/items/show/197. “James A. Harris.” Physics Today, 26 Mar. 2018, physicstoday.scitation.org/do/10.1063/PT.6.6.20180326a/full/. Gonzalez, Lisa. “Jim Harris Left His Mark on Science and Community.” Berkeley Lab Currents, 26 Jan. 2001, www2.lbl.gov/Publications/Currents/Archive/Jan-26-2001.html#_Hlk505136879. “James A. Harris.” African American History Project , National Academy of Science , cpnas.org/aahp/biographies/james-a-harris.html. Kentake, Meserette. “James A. Harris.” Kentake Page, 15 Apr. 2018, kentakepage.com/james-a-harris/.